Gucci has been named one of the top 100 global companies of the year already for several times. Indeed, this company had lived through rises and falls and still are market leaders in fashion business. This company was a family owned business started by Guccio Gucci in 1921. The brand had its ups when it became the favorite movie star and other prominence's fashion brand of 60-ties and 70-ties (Grace Kelly and Jacqueline Onassis were amongst the clients) and had its downs when ugly family fighting started over control of the company (1980-ties). Press even called this period of "Gucci wars". The brand pullet it all together in 1990-ties and now the company is sold to Pinault-Printemps-Redoute company. The brand is offering quite vast range of fashion articles such as clothing for men, children and women, perfumes, handbag line, as well as shoes, eyewear and jewelry. Gucci man bag collection is quite large, as this designer brand offers many sizes and types and colors of handbags and men's briefcases. The today's collection has 168 products (totes, messengers, laptop cases and wallets) to offer the male clients. It is quite a large selection if compared what has been offered by other design houses. 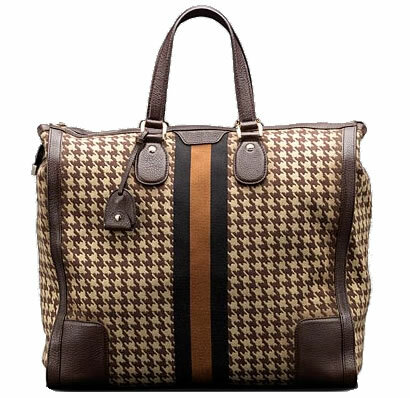 They have a selection of Gucci duffel bags for men, tote bags for men, Gucci messenger bags for men and Gucci laptop bags for men. There are man bag options in leather and canvas, selection of backpacks that can be used for laptops as well, and a large variety of Gucci briefcases and computer cases. 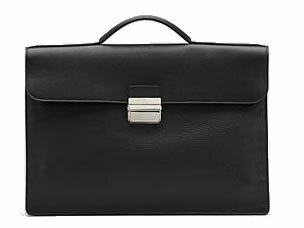 Let's look at the beautiful and very laconic briefcase that they have on their online store. It has very pure lines. The details (made of palladium) are very ascetic and business appropriate. To sum it up - there is nothing to add and nothing to take away. The price is $ 1390. Size is 16" length x 2.2" width x 11" height. If you are in more colors and need something more casual totes and carryalls. For example the one in the picture to the left can be customized with the owner's initials. A nice touch to the customer service. Otherwise this carryall is quite large - 17.7" length x 8.7" width x 16.9" height. It has cellphone and pda pockets plus a zipped compartment. There is an identification tag. The interior is textile lined. Price for this unique piece is 2650 USD + shipping. Definitely this brand has not neglected the men's bags department and you can choose from a vast range of messenger bags or Gucci book bags for men. The price range is agreeable and there are great handbags at a good price. However you might want to wait for the Gucci sale to get discounts on these designer man bags and save some money up.